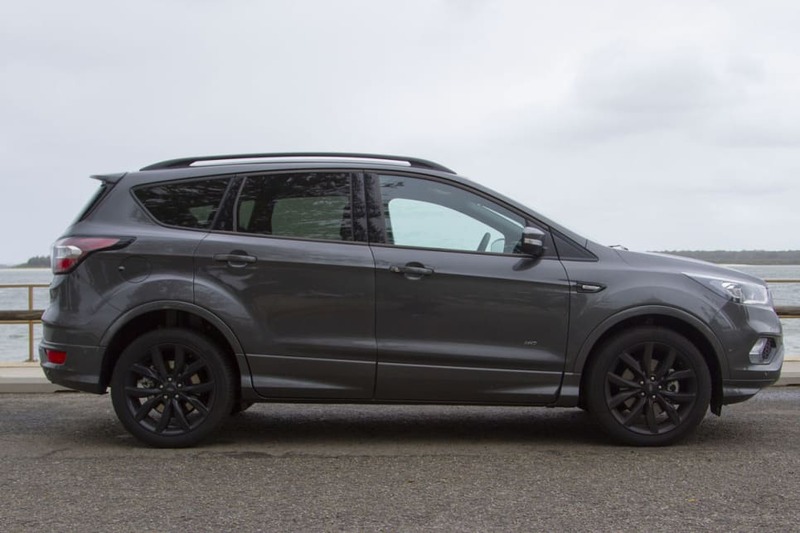 Giving its Escape SUV the ST-Line treatment might be a good way to get Ford a few more punters and dollars. The Ford Escape had a bit of a false start a few years back before things were put right with a facelift and an interior sorting-out to bring it into the game. 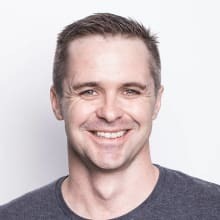 With the endless rise of the SUV, makers now have to find ways to attract a few more punters - or a few more dollars per punter. The idea of adding performance-inspired variants isn't new, of course - hatchback ranges are now awash with GT-line and other 'GTI-lite' variants which seems to be working quite well, thanks very much. 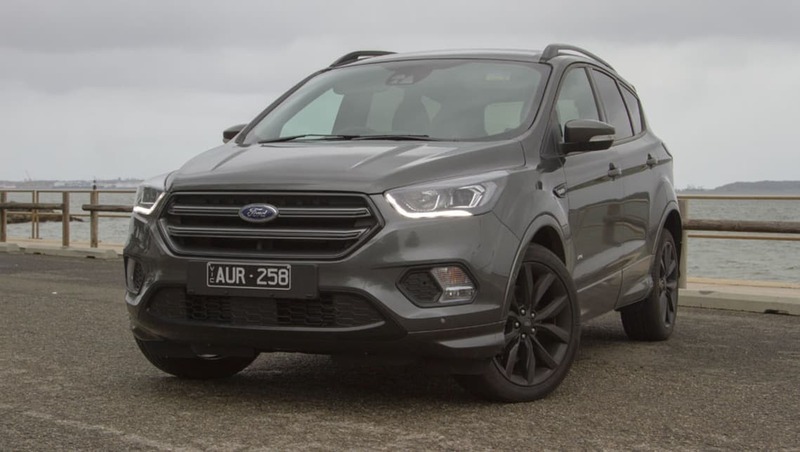 Ford, being a veteran at this sort of thing, thought giving its Escape SUV the ST-Line treatment might be a good way to get a few more punters and dollars. The ST-Line weighs in at $39,990 (plus on-road costs), an easy $5000 below the top-of-the-range Titanium. Standard are 19-inch gunmetal alloys, a nine-speaker stereo, dual-zone climate control, reversing camera, keyless entry and start, front and rear parking sensors, cruise control, front and rear fog lights, sat nav, auto headlights and wipers, partial leather trim, heated and folding power mirrors and a space-saver spare tyre. 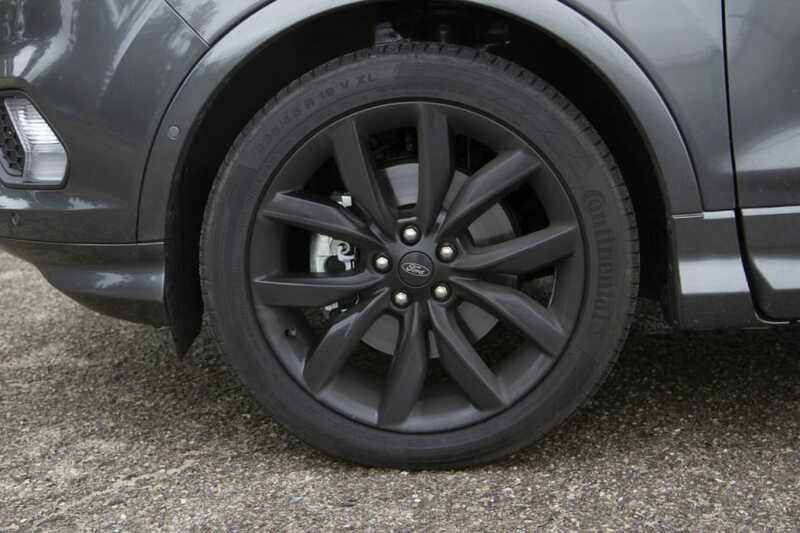 19-inch gunmetal alloys are standard with the ST-Line. Sat nav also comes standard. Front and rear fog lights are standard, but auto high beam can be optioned as part of the 'Technology Pack'. 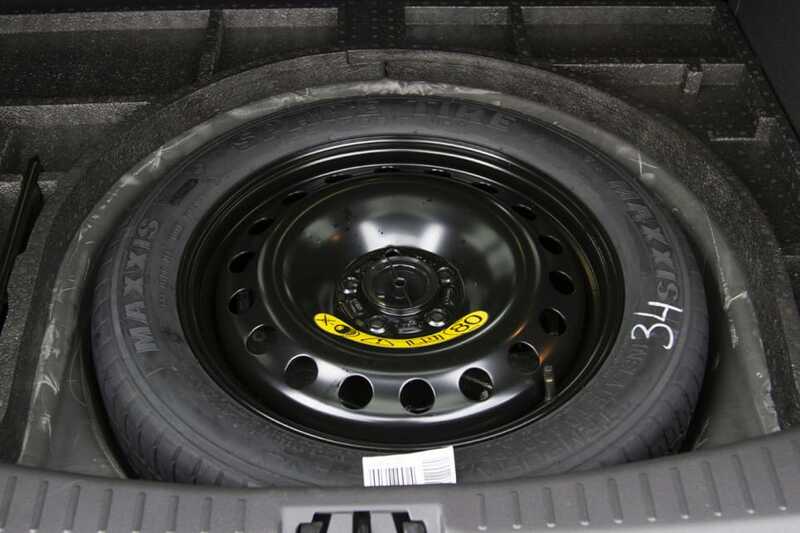 Each ST-Line comes with a space-saver spare tyre. Our car had the absurdly good value 'Technology Pack'. For $800 it's a no-brainer because you score upgraded forward AEB for high speeds, lane departure warning, lane keep assist, driver attention detection, auto high beam, active cruise and tyre pressure sensors. Just a pity it's not standard, really. Also on board was the useful but debatable hands-free tailgate for $950. 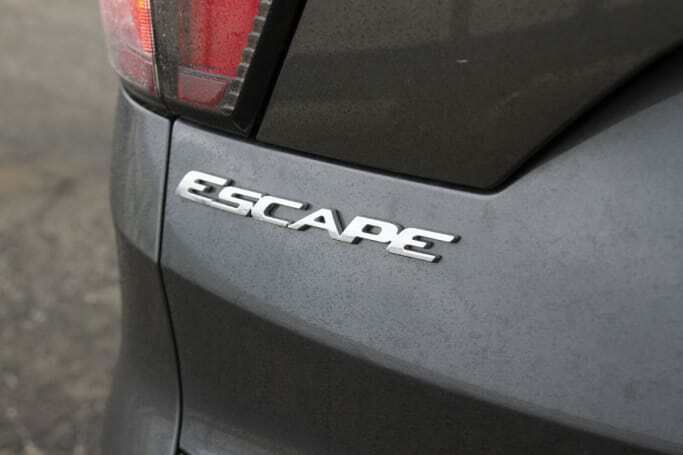 The Escape exited the womb as Kuga but was renamed in line with Ford's expanding SUV range. 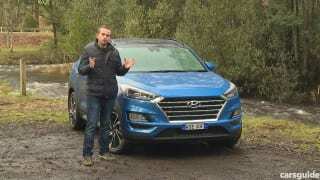 They start with E, you see - Everest, EcoSport etc. In fact, I had an Escape a while back that still had Kuga sill plates such was the speed of the change. 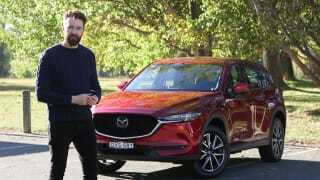 The Escape is a reasonably familiar sight on our roads but it's not exactly selling the way, say, the Mazda CX-5 does. 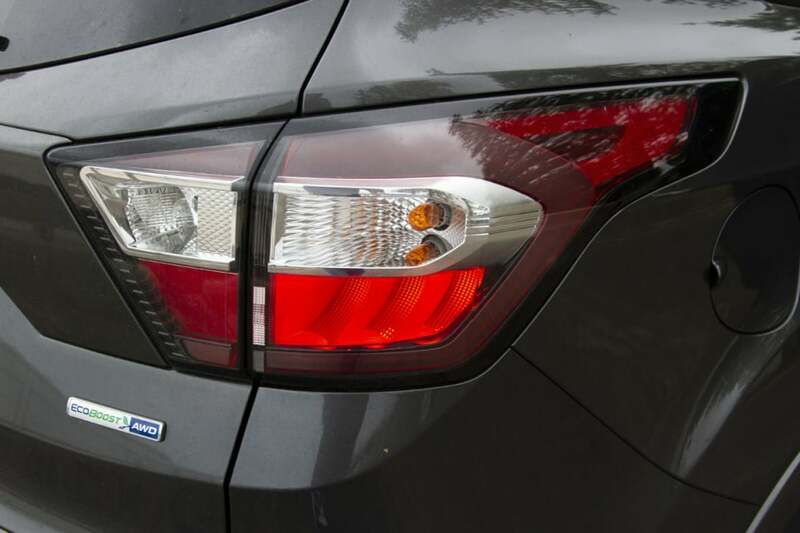 The Escape is readily identifiable as a Ford, echoing the about-to-be-replaced Focus and Fiesta. The original trout pout of the Kuga was superseded by something a little more 'expansive'. The Escape is a reasonably familiar sight on our roads. The Escape is readily identifiable as a Ford, echoing the about-to-be-replaced Focus and Fiesta. The blacked out grille is distinct to the ST-Line. To this base, the ST-Line adds a set of dark finish 19-inch alloys, blacked out grille, fog-lamp surrounds, roof rails and rear valance. It's fairly mild. The lower ride height does help, though. It could look a bit meaner, but that's not really the point of the ST-Line brand. Inside you have the same seats as the rest of the range along with red stitching on the shifter and steering wheel. A set of alloy-face pedals, stainless steel kick plates and ST-Line floor mats complete the changes. 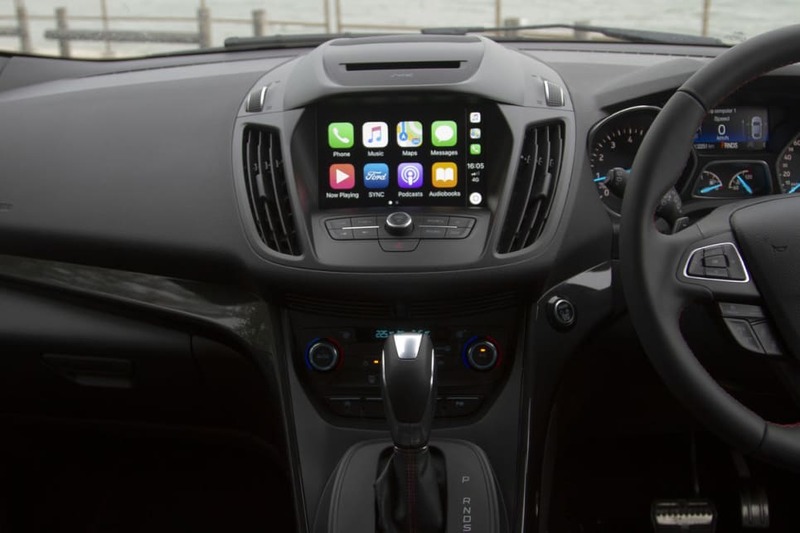 The interior is otherwise unchanged, and that's no bad thing, except we have to talk about the touchscreen. It works really well and is a good size but the awkward angle of the surrounds make it hard to hit the targets. It's a bit of an own-goal because otherwise it's very good. The Escape is one of the roomier mid-size SUVs, although it doesn't quite match the interior flexibility of the VW Tiguan. 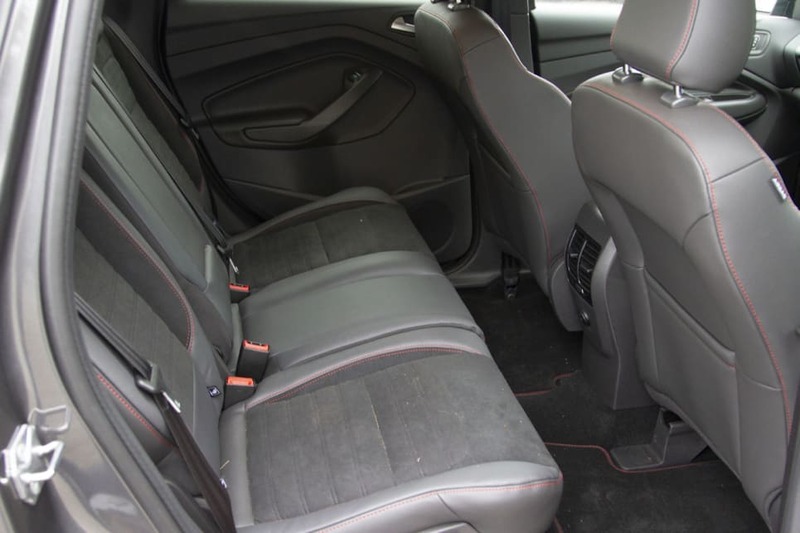 Rear seat space is generous, with good head and legroom and plenty of foot room. Rear seat space is generous, with good head and legroom and plenty of foot room. 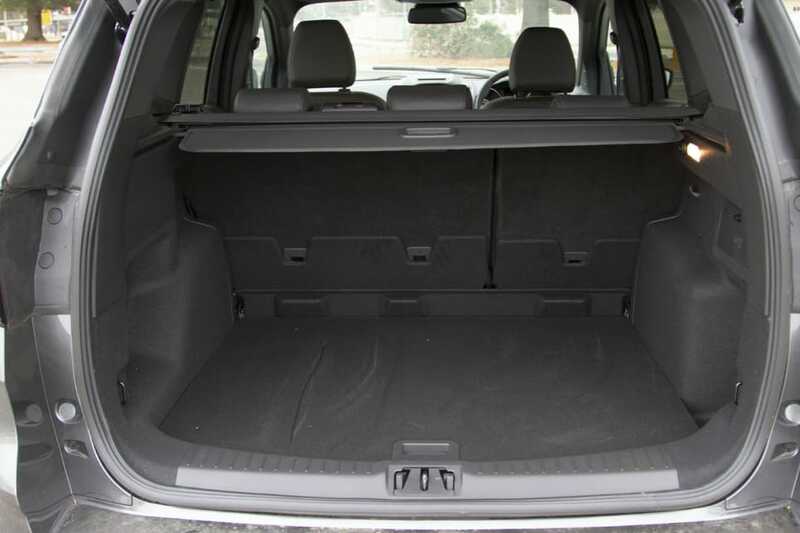 The boot will take 406 litres with the rear seats up. Put the rear seats down, and you've got 1603 litres. The tailgate opens high and wide, which is handy for loading up. 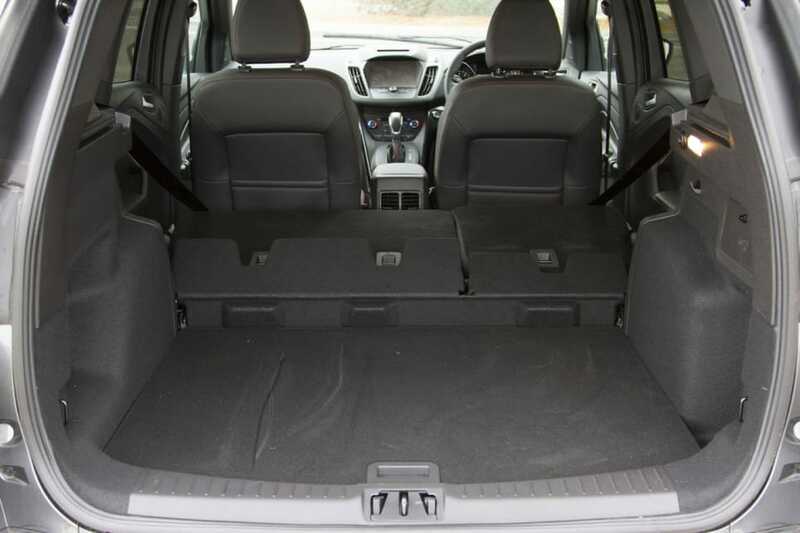 The boot will take between 406 litres (rear seats up) and 1603 litres (rear seats down). There are four cupholders - two up front and two in the rear armrest, with bottle holders in each door. The central armrest bin is deep and accommodating, and there are a few good spaces for stashing loose bits and pieces. 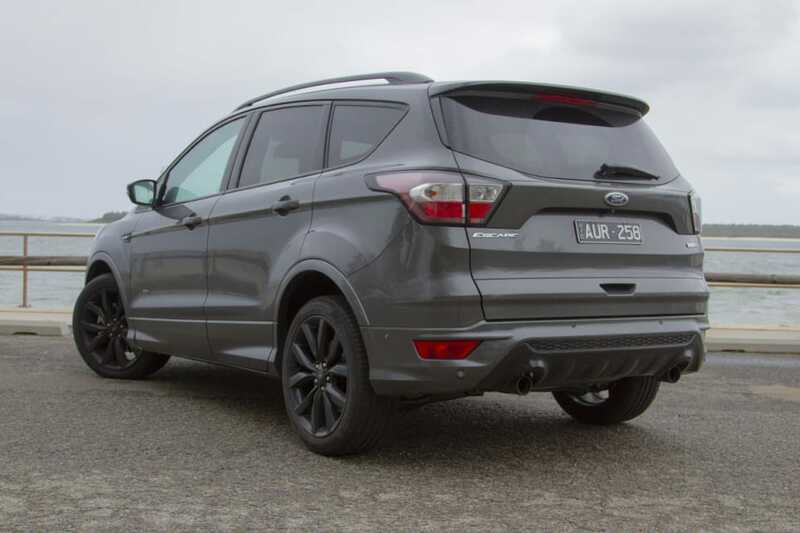 The Escape's 2.0-litre turbo four produces 178kW/345Nm to help propel this 1.7-tonne machine along. Power reaches all four wheels via a six-speed automatic. 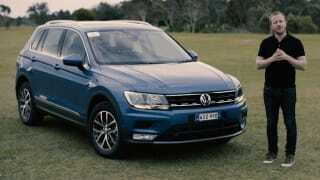 Towing capacity is rated at 750kg unbraked and 1600kg braked. 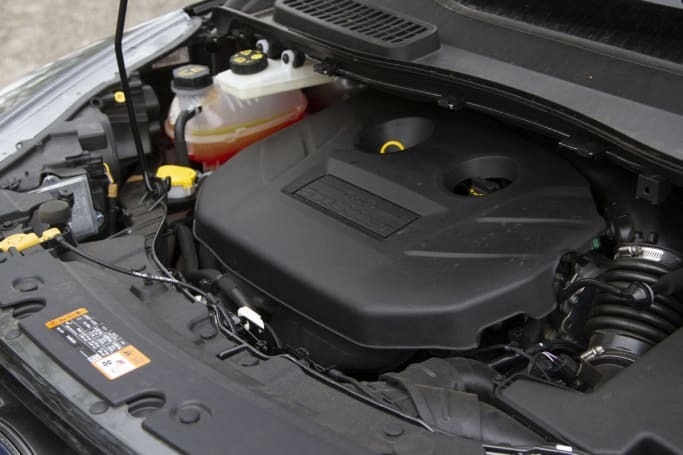 The Escape's 2.0-litre turbo four produces 178kW/345Nm to help propel this 1.7-tonne machine along. Ford reckons you'll use 8.6L/100km on the combined cycle. In the real world, including a roughly 200km round trip run from Sydney up to the Blue Mountains we recorded 10.2L/100km. The only drama is that it runs only on 95 RON premium unleaded. Having said that, it's obvious rivals do too if they have anything like the available power of the Ford engine. 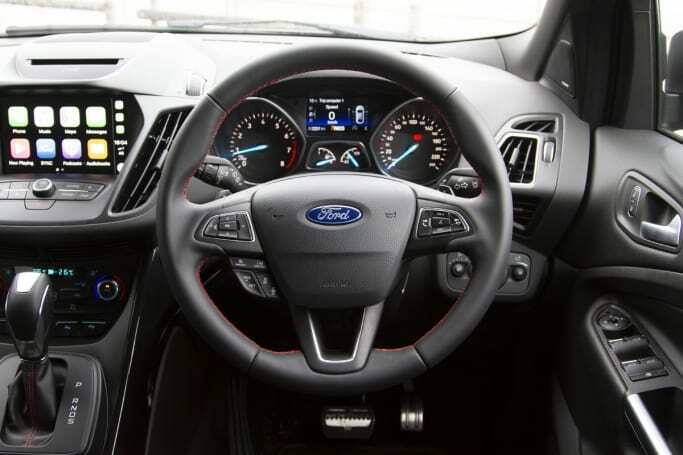 The ST-Line comes loaded with seven airbags, ABS, stability and traction controls, lower-speed AEB, reverse cross traffic alert, blind spot sensor, reversing camera, rollover stability and forward collision warning. The $800 Technology Pack adds high speed AEB, lane departure warning, lane keep assist, driver attention detection, auto high beam, active cruise and tyre pressure sensors. Ford now offers a five-year/unlimited kilometre warranty across the range. Roadside assist is via a membership to your local motoring organisation and if you service it with Ford, you get a 12-month extension. Ford's 'Service Price Guarantee' program is a kind of capped-price servicing thing, with pricing for the services (every 12 months/15,000km) and some additional items. The first service is $350. 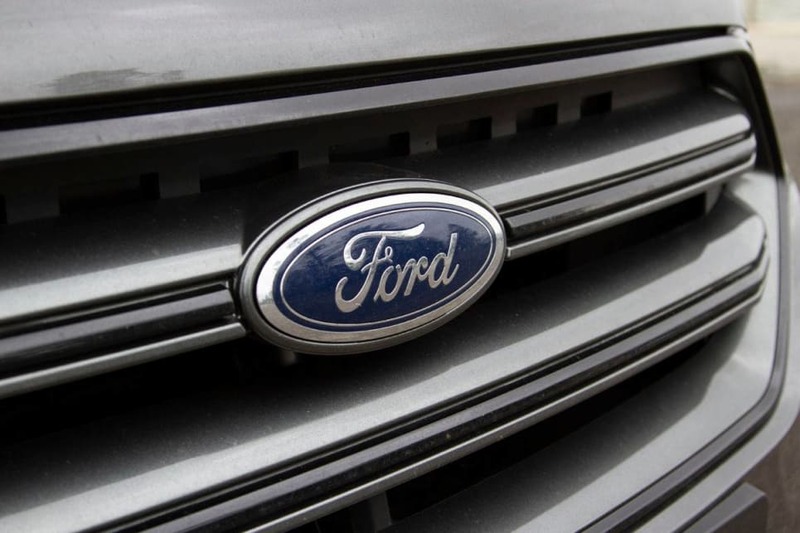 Ford now offers a five-year/unlimited kilometre warranty across the range. Like the Focus ST-Line I drove a little while ago, the Escape has no more power than any other car in the range. A hot SUV it isn't. The changes are restricted to the bits that make the car handle and grip, and even then, it's not a lot. The ST-Line rides 10mm lower and has stiffer anti-roll bars to further rein in any body roll in the corners. Critically, the gunmetal 19-inch alloys are wrapped in Continental Sport Contact tyres, which is not the sort of rubber you expect on a mid-size SUV. This is a good thing. One of the key changes to the ST-Line is the steering. The last time I drove an Escape I was struck by the inert steering. Things are much improved in the ST-Line, with a much more involving set up letting you know what's going on underneath. One of the key changes to the ST-Line is the steering. As a day-to-day proposition, it's a very comfortable machine. I feared for the squishy feeling of the front seats but this was unfounded - a long day at the wheel yielded none of the fidgetiness soft seats can cause. The lower ride height also makes it quite easy to get in and out of and it's an easy car to manoeuvre apart from a big-ish turning circle. That engine is as good as ever - strong, torquey and well matched to the six-speed automatic. The all-wheel drive system is also very happy to play ball, as it is in the Titanium with the same engine. The Escape ST-Line is the second of its name I've driven and again after the Focus, I've come away liking it. While there's no full-fat ST to help make sense of the brand, it's nice to have a mid-size SUV that isn't German come to the party with a bit of driver appeal (okay, technically it is German...). I think the Escape is a bit underrated and it's sadly inevitable that the ST-Line will suffer the same fate. But, that's the warzone that is Australia's SUV market. Does the Escape ST-Line have enough oomph to grab your attention? Tell us what you think in the comments below.